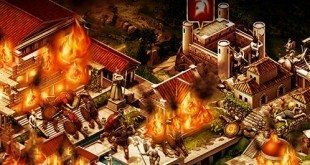 Home / Articles / Does Game of War have hidden combat boosts? There is a long history of video game creators having a bit of fun, hiding little jokes in the form of ‘Easter Eggs’. For example here is a nice list of the top 100 easter eggs in video games. There is also a bit of a history of games having hidden abilities that require unlocking, with one of the best examples being in the Pokemon universe, where there are a variety of hidden abilities that can be unlocked. MZ is also known to have a bit of fun now and then. Catzilla craziness for April fools, all those hilarious descriptions of cores and pieces, as well as the enormous joke that is the alliance city (ouch, sorry, bad joke). Alliance City – Trade, scout, rally, plus all these new urban and rural buildings to unlock, plus all those research tabs. Yep, any day now. But beyond these jokes, is it possible that MZ is also getting into the hidden boost business? Well, about a month ago, a number of people started noticing some anomalies with combat boosts, and in particular significant discrepancies between what their hero preset calculator was saying they were going to get, and what they actually ended up getting. And we are not talking a few % points here, we are talking a few hundred % points. So, after a few weeks of playing around, we think we can do reasonable justice to describing what is going on. 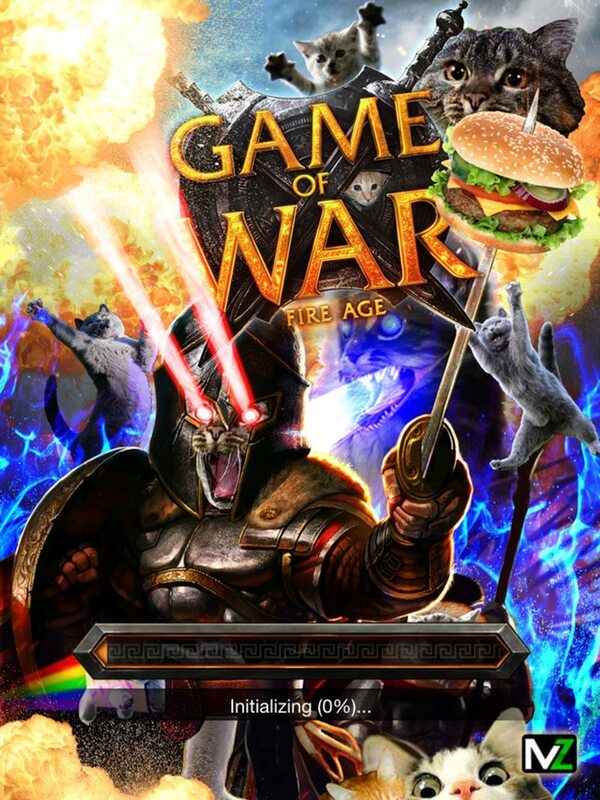 We can confirm that there are indeed hidden boosts in Game of War. The hidden boosts do not appear to be affected by use of different hero gear, relics or cores. The hidden boost appears to calculate correctly in preset calculator when you already have 90 points allocated to the 3 altar skill points in your currently equipped hero tree, but does not appear to show the hidden boost when your currently equipped skill tree does not have points allocated to the altar boosts. The hidden boost still gets applied, but just does not calculate correctly. In summary, these 90 hero skill points are hands down the most important 90 points to allocate when setting your hero tree for battle!!!!! When you step from hero level 54 to 55, the primary change is that you get additional hero skill points, and you can now allocate points to the 3 altar boost items on the left side of the skill tree. 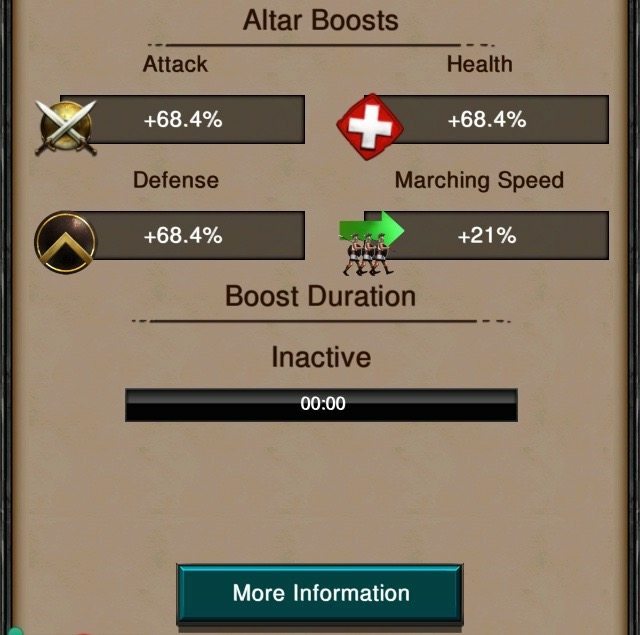 These three items, altar boost health, altar boost defense, and altar boost attack, can have up to 30 points each allocated to them. Troop attack altar boost requires that 20 points each are allocated to the troop health and troop defense altar boosts. Once all 30 points are allocated to each of health and defense, the altar boost increases a RELATIVE 80%, not an absolute 80%. So it starts at 38% for level 21 altar, but instead of going to 118% as some might think would be logical given the way most combat boosts are additive rather than multiplicative, instead it goes up by a relative 80%. 80% of 38% is 30.4%, so the new altar boost becomes 68.4%. So, the first inclination is to feel a little ripped off. Most people think that given almost everything else in combat boosts like this is additive, then these boosts should be additive as well, i.e. they should be 118%, not 68.4%. But if you look into a little deeper, you find some seriously unexpected boosts also come along for the ride when you set these 90 skills points. DO BUILDINGS AFFECT THESE HIDDEN BOOSTS? I am a defensive player, however during the week, I have no particular need for an embassy, and often replace it with a marketplace during the week. Deconstructing an embassy does not reduce the hidden boost that you get, despite the building having a troop defense benefit. Likewise the watchtower which has a troop attack debuff boost does appear to affect the hidden boost. What about the standard buildings of villas, barracks and hospitals? What we appear to see here is that a level 21 villa is worth 3.6%, rather than the usual 2%. This is a relative 80% more than expected!!! And a level 21 barracks is now worth 18%, rather than the usual 10% more. This is again a relative 80% more than expected. Not shown here, but there is no incremental benefit from levels 1-20 for both the hospital and villa, as there is no combat boost until level 21. The barracks however has incremental steps, and each of these intermediary troop defense boosts appear to benefit from the relative 80% incremental boost. DOES RESEARCH AFFECT THESE HIDDEN BOOSTS? I am currently playing as a rally trap, so I have my troop defense research pretty much maxed out. However, I had a few researches left on troop health within the defense tree which I could test out. Completing individual infantry / ranged / cavalry health researches made no unexpected difference to these stats. Completing trap attack research did not appear to increase the boost for trap attack. However, when we look at troop health research, completing the level 8 Troop Health II research in the Defense Tree……. The magnitude of this boost should have been 14.81%, however the magnitude of the boost received is 26.66%. This calculates as a 80.01% relative increase compared to the boost that was expected from completing the troop health research. Does that 80% figure sound familiar? DOES HERO GEAR AFFECT THE BOOST? No, equipping different types of hero gear does not appear to affect the boost. No, gems do not appear to affect the hidden boost. No, troop debuffs are not affected by this hidden boost. HOW BIG IS THE OVERALL BOOST? The quick answer is a relative 80% on top of your baseline combat stats for health, defense and attack, based upon your researches and buildings. But each person’s hidden boost is likely to be different because of differences in research levels and buildings. First off all, let’s start with a naked hero. HERPES has had hero skill tree reset, with all level 55 hero points available for allocation. She has also had all her hero gear removed, meaning that all we are getting is baseline research and buildings boosts, without any hero boosts at all. We screenshot the baseline combat boosts, then we add just the absolute minimum points in the skill tree to get to the altar boost section, and screenshot it before we apply the 90 skills points. Then we screen directly after the 90 skill points. As you can see, allocating minimal points (2 in troop attack, 5 each in troop health 1 and 2, and 5 each in troop defense 1 and 2), increases boosts in a very small way. 3% troop health and troop defense, and 0.5% troop attack. When we add the 90 skill points for the three altar boosts, however, the picture changes markedly. We get an incremental 41.6% troop attack, 352% troop defense, and 175% troop health. As a relative % of baseline, that is almost 50% increase for troop attack, and almost the magical mystical 80% number for troop health and troop defense. The explanation for the discrepancy on troop attack and troop defense appears to be that the calculation is based upon only pure troop attack and troop defense research, and EXCLUDES the ‘troop attack with hero’ and ‘troop defense with hero’ research that exists in the Hero research tree. If you take out the 32.5% for troop attack 10 and 32.5% for troop defense 10 in the hero tree, the baseline in the above tests becomes 52% (84.5 – 32.5). The incremental increase of 41.6% is EXACTLY 80% of the adjusted 52% baseline. Likewise, adjusting the baseline troop defense stat of 472.5% downwards by 32.5%, means that as a proportion of an adjusted baseline of 440%, the troop defense hidden boost of 352% is EXACTLY a relative 80% increase. If you are a big attacker, it is highly likely that you will have already done most of the march tree and defense tree research anyway. And it is highly unlikely that this kind of boost is going to encourage you to change your building setup all that much. With each level 21 villa now worth closer to 4% troop attack, it remains likely that most attackers are going to stick with higher numbers of villas for troop training reasons. And if you haven’t reached hero level 55, there is a very nice boost in all-round stats that is worth shooting for. It basically gives an 80% boost to some of the parts of the defense tree, and the defense tree has already effectively allowed big attackers to allocate more and more effort into boosting their overall troop attack stats. This will now mean that big attackers with maxed research can have around 700-800% troop health and troop defense without using a single gem that boost troop health or defense. If you have something like 15 level 21 villas, it effectively means you are likely to get an incremental 60%-70% troop attack, plus the incremental 30.4% troop attack boost from the actual altar itself, assuming you have active altar boosts. When you think about it, that is actually MORE than if it was a straight 80% absolute increase in troop attack from those skill points. If you are a rally trap, this is a very very nice increase in boosts. Whether you are hospital based or barracks based, there is a serious encouragement for you to consider pushing through to finish both the first and second sections of the Defense tree. 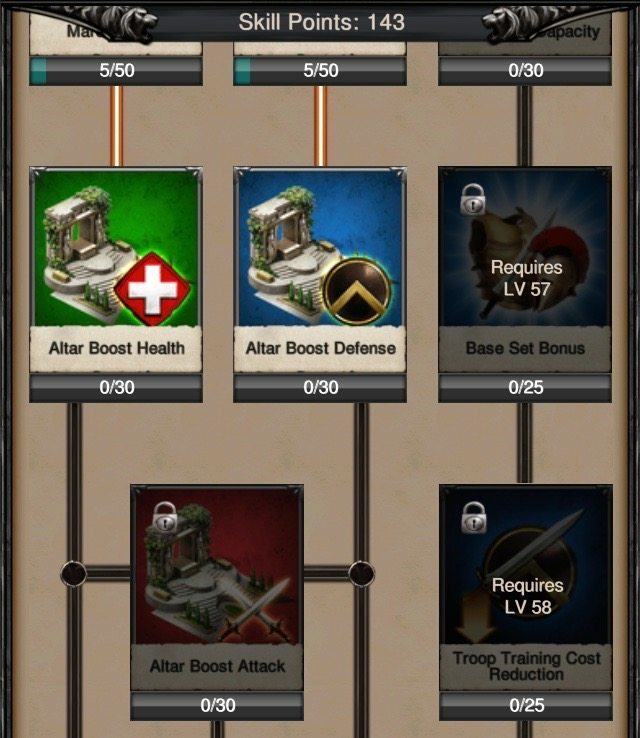 80% on top of what is offered in terms of health and defense from the first two sections of the defense tree basically means those trees are delivering 235.8% increase in defense and health, in addition to the 131% of each individual troop health and troop defense, for a combined total of 366% of each. Will the magnitude of health and defense boosts change how you structure your model? Probably not. Given it is a relative 80% increase in both health from level 21 hospitals and defense from barracks (not necessarily level 21), then it is unlikely to change how you approach taking rallies. But it becomes pretty darn important for rally traps to get to hero level 55. If you are a solo defense turtle at sh21, the incremental 5M hero power is most likely worth an increase in troop attack, troop defense and troop health. Given most solo defense turtles are going to be hospital based, it is likely that the boost will be larger for troop health than the other stats. It is also likely that the research levels on solo defense turtle are going to be somewhat lower, so the total magnitude of the hidden boost you receive is going to be lower than rally traps or big attackers. Without having researched troop health, troop defense and troop attack in the March tree, and with only a small number of turtles having the Academy 21 pre-requisite to start the Defense tree, it is likely that the total magnitude of boost is going to be somewhat lower than that received by big attackers and rally traps with more Defense tree research completed. It is likely that the incremental benefit is not going to be present for sh14-20 turtles. Most of the building combat boosts require level 21 buildings (with the exception of barracks), so sh14-20 turtles will completely miss out on any health benefits from having hospitals. Likewise, the prison boost will not exist (requires level 21 prison), and the altar boost will be reduced because of a lower altar level (not that many turtles tend to execute regularly anyway). Also the maximum troop health and troop defense is constrained by academy level for sh14-20 turtles, so the magnitude of hidden boost from a level 55 hero is likely to be significantly lower. The best way to estimate your potential boost is to reset your hero skill tree, take off all your hero equipment, and then look at your troop attack boost, your troop health boost and your troop defense boost. Once you have written them down, multiply them by 0.8 to work out what the incremental hidden boost is that you are likely to receive by moving to hero level 55. And then you can make a bit of an informed decision on whether to push to hero level 55. But all these hidden boosts are completely useless to you unless you are able to reach hero level 55. To go from 50 to 55 requires 1.5B hero XP, which has a notional gold cost of 3.6M gold if hero XP is purchased in the gold store at 25M per 60,000 gold. Considering the relative value from pushing to hero level 55 or spending an equivalent amount of gold on pushing higher up the VIP ladder, I know what I would choose anyday. I will always take the combat boosts rather than spending gold obtaining interface functionality that should have always been part of the interface (open all chests). As for the VIP 14 released today which opens ALL chests in one go, saving people at VIP 12-13 about 30-60 seconds, my mother always told me that if you have nothing nice to say, don’t say anything at all. Nuff said. If you are a player who has been quibbling whether it is worth rebuilding your Gymnos, can I suggest that the magnitude of benefit you get from a level 55 hero is definitely worth it. Plus make sure you have a 25% Hero XP bonus for each and every kill event, as well as any time you are doing a research push. With the release of hero levels 51-60, MZ has hidden some combat boosts in the 90 skill points available to allocate to altar boosts. Instead of just increasing the altar boosts of troop health, troop defense and troop attack by a relative 80% (from 38% to 68.4%), it also appears that this relative 80% is applied to almost all baseline research and building combat boosts relating to troop health, troop defense, and troop attack. The one exception appears to be the ‘troop defense with hero’ and ‘troop attack with hero’ from the Hero tree, which appears to be excluded from the hidden boost. This does not apply to debuffs, does not apply to hero gear or gems, does not apply to special buildings, and the hidden boosts are active irrespective of whether your altar is actually glowing blue or not. The breakdown of the hidden boosts is dependent upon how much research you have completed (particularly the combat, strategic combat, defense and march trees), and in particular, how you have arranged your urban buildings in terms of the breakdown of hospitals / villas and barracks. At 3.6M gold to go from level 50 to 55, it is definitely an expensive upgrade, however it is much cheaper than going from 55 to 60, and probably represents much better value than using that gold on VIP points. Your mileage may vary!!!! For non-spenders, the one main upside here is that at least there is now a specific reason to focus on levelling up your hero consistently over time. A lot of people we have spoken to on this issue reported that leveling their hero up was mostly pointless, as the incremental hero skill points from levels 51-53 did not really seem worth it. But when they understand the magnitude of boost available at hero level 55, all of a sudden there is more of a purpose to mid-week intra-kingdom combat, and trying hard to keep fighting during Kill Events. And one fascinating discussion that has come up again and again is this: “could this possibly just be a bug in MZ coding, rather than a deliberate hidden series of boosts?”. We believe that they are a deliberate hidden series of boosts, not a bug. They are more like the hidden abilities in Pokemon, not really like Easter Eggs, and not likely to be a bug. 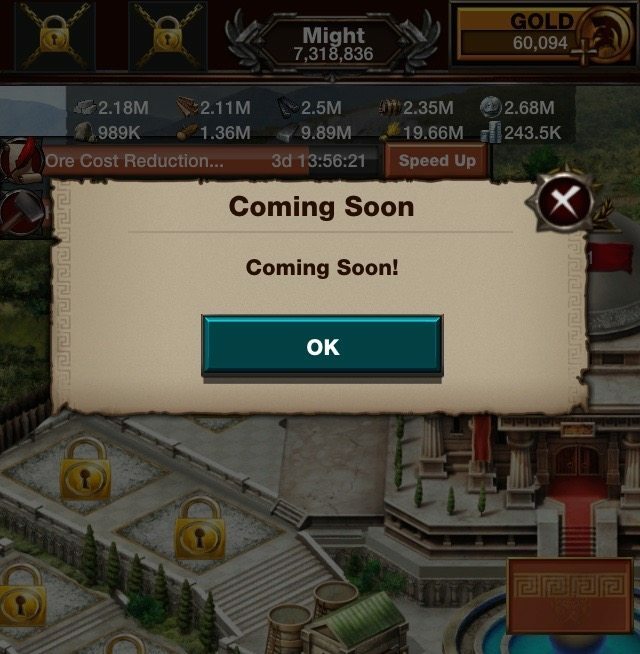 If they are indeed a bug, we think it is highly unlikely that MZ would ever acknowledge them as a bug, because taking away combat boosts of that magnitude from the big spenders would be a nightmare that MZ would definitely want to avoid, wouldn’t they…..
As always, please feel free to tell us what you think of these hidden boosts in the comments. 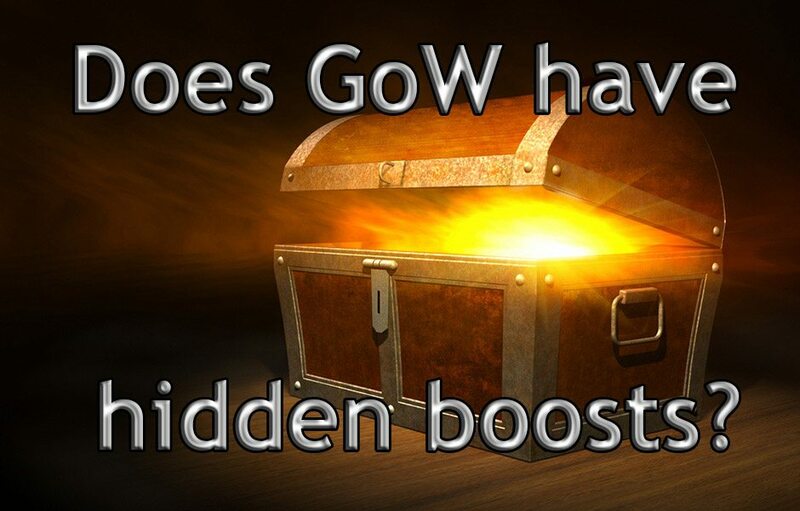 Please let us know if you have any additional information on what is included in the hidden boosts, particularly if you have found anything that contradicts the above supporting evidence, or any additional hidden boosts. How do you view your baseline troop boosts? I don’t have hero preset calculator. When i reset my hero tree, unequip all hero gear, and click “Hero Boosts”, my attack, defense, and health show 0%. I’m not sure where the screen is for the baseline hero boosts? This is a major bug I think! I have it also, in 2 accounts. One account has 1 billion in research power and I still have almost all 0s. Silverhair, thanks for the article. I might have never spotted the missing points otherwise. To check your account… If you unequip your hero and reset skills without using any of the skill points… Then when viewing Hero Boosts all percentage points should come from completed research and level 21 villas, barracks and hospitals. If you’ve done lots of research and have mostly 0s, then you have the same problem. Even in the rows where I do have points they are significantly lower than they should be. I have this problem as well. Do you know of a fix for it or if there is a way to see your actual boosts i.e do you know if the % with gear equipped are accurate or could that be affected by the bug as well? Just tested and doesnt work for me. put in minimum points in tree looked at troop boosts. added 30 to each altar boost. looked at troop stats again no change at all in troop attack health and defense. I have level 58 hero and lots of def and march research done already. Can any one confirm if this has worked for them? Did you try equipping the preset after the changes? This worked for me. Do you still have these boosts when you destroy the altar? Or do you need the building for the boosts to work. Watchtower debuff? Under your overall debuff? Are they going to do that blind watchtower ?? Would be a handy tool, however there are a lot of variables, hero gear, research levels ect. Due to this article I have found a descrepancy with the preset calculator. If you view the boosts of a preset while wearing a diffent combat oriented preset it will show false numbers. ie… While viewing the boosts of my Xena while wearing generals gear I show 1049% defense. While viewing the Xena boost while wearing my colossus I show 1389%. This only occurs in the preset calculator. Therefore if you make a set of cores the only way to view their complete and true numbers are to equip them. Please test this out for yourself. I have confirmed several members of my alliance experience the same effect. The percentages are just an example and not my true numbers. Yep. I get the same thing. Like you said, only way to view the true values is to equip a set and go to your boosts in your profile. Is there a section on RALLY TRAPS? I can confirm that this works without an altar! Ive never unlocked academy 21, but recently hit hero 55 so i decided to try it out! And as a sub 100M trap, i had an additional 16% attack, 104.8% defense and 160.8% health boosts after allocating points to Altar boosts in the skill tree. Usually kingdom-specific boosts. My kingdom has a 100% troop attack bonus that does not apply to strategic troop attack. With hero level 55, this is magnified by the same 80% mentioned in this article when i have my 90 points applied to altar boosts in the hero tree, so my troop attack is 180% higher than my strategic troop attack. Is it still thus? or has this been changed by one of the recent updates? Why does regular troop attack have a 200% increase over strategic troop attack? Everything percentage is equal on gems, gear and all boost for regular and strategic troops. Is this considered confirmed? Because it doesn’t make sense to me. I don’t see how you get altar bonus unless you have a boost being applied from a recent hero execution. Why would MZ give us an altar bonus without having an altar, or without having sacrificed someone at that altar? I dont see this in when i do presets. I also do not have an altar. With armour equipped on preset you get no boost to troop attack defence or health. Have a level 59 hero with collosus set. All research maxed out down as far as set bonuses. Sh21 as well as altar and prison. I burned down my altar for 1 Villa more and as it seems to me the hidden-% still DO apply without an altar at all. haha yeah will do soon enough and post the result here. just don’t have an altar at the moment cause i’m in army building mode, but as soon as i do i will update here. thanks again for a great post. Haven’t tried deconstructing my altar just to find out that last piece of information. How about you work it out and let all of us know. Did you ever find out if you need an altar for it to work ? Does this require an alter? I have the boost, but another rally trap would like to know prior to KVK if possible. So after some testing with my presets Ive figured out that when you equip a preset that is set with the Alter Boosts. The boosts will apply to whole sets that you have in your presets. They dont have to be equipped to see the boost that you would get from the Alter boosts even though you havent actually equipped the actual set. Or have Alter Boost points used in said set. So basically you get a preview of the Bonus you would get if you spent the points on the Alter Boost for that set without having to equip the set. Obviously when you equip the set it wont add the Bonus unless you set the points for that set as well. so basically it is not a hidden combat boost, just a sneak preview of what the boost would be if you had it applied? Its hidden because you wont see the boost until you equip the set. The way I said will give you a preview of what your getting without having to work it out etc. For Cores mainly. Kinda like Set Bonus but without seeing the bonus beforehand. Riddle me this.. beneath Altar section. Rally Attack Bonus – Is defending a wonder considered a Rally? Does boost apply only to rally sent on wonder (if allocated obviously) – or is wonder defender also eligible for Rally Attack Bonus (if allocated). Thanks! Tried to reset and get hidden bonus on account with lvl 60 hero and all research completed. It made no difference. dammit. I was just about to buy some XP points too to try it out. Has anyone else had this issue or is it an isolated issue? Nice article. Too bad it’s more than likely a glitch than a hidden boost. No way it was intentional. You don’t even need an alter for it to work. All extra boost attack, defense increases by more than they should. Isn’t if funny how MZ cancel a kill event scheduled for tomorrow and replace with the colesium with hours of the article? i am a rally trap too but i replaced altar with hospital so i guess for this to work i need to rebuild it? Great timing. I am at lvl 54 considering if i want to spend gold/resources to push to 55. This makes it worth pushing forward with 25% XP boosts and the like to get there. Thanks! Do you need to have an altar at all to benefit from this? My ralley trap is 1.6 B and I run 22 hospitals, watch tower, forge and 1 barracks- im level 60. 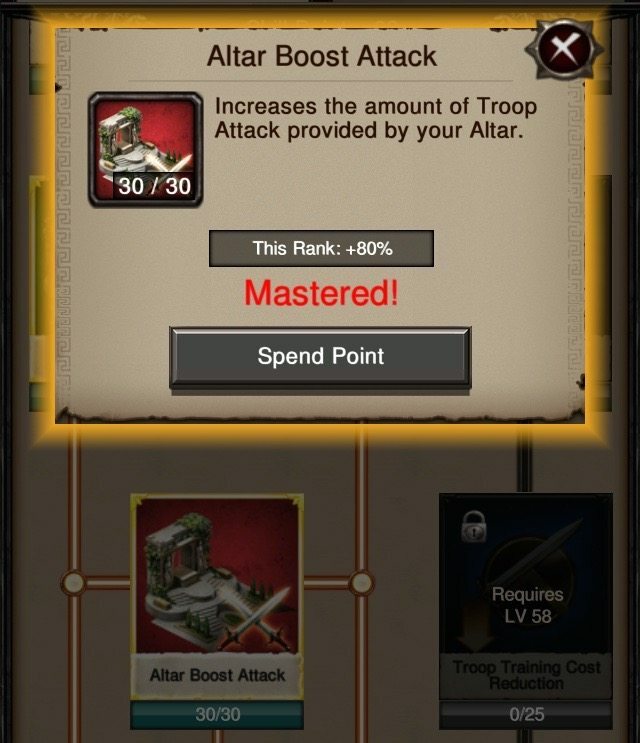 Right now I don’t have an altar (or prison) so I don’t use those buffs, but will the hero skill boost for altar bonuses give me that 80% relative on my research/skills as you noted above WITHOUT building an altar at all? This is amazing!!! I am also a rally trap and I tore down my altar ages ago. Do these hidden boosts still work if you don’t have an altar? From what I read it sounds like you don’t need one. Thank you for spending the time to research and write this! I tore down my Altar in favor of another hospital. Does the secret boost still apply if you do that’ve an altar? Also, do you need to have executed an enemy hero for this to work? How about those whose hero is already level 60, any additional boost ? I am not aware of any additional hidden boosts by moving from 55 to 60. That does not mean they don’t exist, just that I am not aware of any. I doubt I will reach hero level 60, so will likely never find out first hand. Thanks for your reply. I’m currently at hero level 59, so I am very interested to know if there is any additional boost. Maybe some others might be able to help me on this. Does it really matter? Is the presence of absence of hidden boosts at hero 60 going to change your decision on whether you finish the leveling up from your current 59 to level 60? Probably not. This is great and I hope to see more hidden boost to come. What I would like to see most of all is an increase in the ability and chance of solo attacks/fighting. Most accts are so large now it’s pointless to solo and everyone is afraid of loosing there heros you see accts sitting next to each other and no one doing anything. Maybe MZ could incorporate a new special item, that would work for a certain number of attacks or equip a certain amount of time, definitely not peanent or it would remove some fun/danger, that protested one soldier in an attack from dying so that soldier and your hero was guaranteed to March back during that attack. I believe that would greatly increase solo attacks and give the smaller accts more reason to attack these billion soldier accts without fear of losing hero for three days. This would also help level the playing field and make no one completely safe to be unshielded and not get zerod. what does it mean for a sh18 turtle ? other than the fact that the boost would be lower, is it still a good boost to aim for ? do you need to execute a hero to get those bonuses ? or do you need to have a hero in your prison ? do you need a prison at all ? does the altar lvl matter much? thanks for all your amazing posts, and hope you can answer some of those questions. sh18 turtle will likely only get a minimal boost. Will not get any health boost from hospitals or villas (level 21 only), but will get a small incremental increase in defense from any barracks you have (very small). Will get an increase in health / defense boost from combat research, but at sh18, that maxes out at health / defense level 6, a cumulative 31%. Best way to check your potential increase in boosts is to take all your hero gear off, reset your hero skill tree with no points allocated, then look at your boosts page. Multiply your troop attack, troop health and troop defense boosts by 0.8 to work out how much incremental boosts you would get. I am guessing that as an sh18 turtle, it is going to not be worth the 5M increase in hero power. No, altar does not need to be active (you do not need to have executed a hero). If you have a hero in your prison, and you are level 55, it appears that the troop attack bonus is also increased by a relative 80%. This will depend upon prison level and hero level. However, there is ONLY a prison boost for troop attack at prison level 21, so it is not applicable to an sh18 prison. Yes altar level will matter. It will likely be a relative 80% on top of the altar boost for your level. At sh18, the baseline boosts are 21%, so you would get an incremental 16.8% on top of the 21% from executing a hero. so it would be another thing driving SH18 turtles to go for SH21 turtle. with the state of the game, and knowing that i am now lvl 55 hero, would you recommend a maxed SH18 turtle to jump to a SH21 turtle ? I feel like the changes of the last few weeks are just pushing us toward that more and more. I think you are correct in your assessment that the trend is inevitably towards sh21. It is impossible to go back, but MZ certainly appear to be trying to penalise people from staying at sh18 etc. what should a turtle cut out to make room in the skill points to get those 90 points maxed out ? i feel like trap attack should still be maxed, but then you dont get as good a buff if you don’t get as much health and defense as possible…what do you think should be prioritized for a turtle going down that left path? keep the trap attack maxed or not ? get as much health and defense or not ? and since it seems that with big army defense wins over health, put more points in that than health? One of my kingdom colleagues (thanks Opti), has pointed out that in addition, heroes held in prison also appear to get this relative 80% increase in boost. So a level 50 hero which used to be worth a 30% troop attack boost, now is worth 54% troop attack once you reach hero level 55. Do you need a prison to make this work ? or will just having an altar work ? would you recommend lvling up the altar as high as possible for a turtle account ? was it confirmed that you do or do not need an altar for this to work? but it is for sure that you do not need a prison right ? how good is it without unlocking the defensive tree?